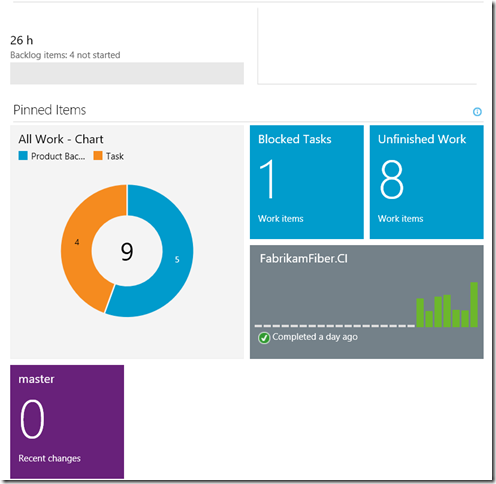 Today Brian Harry announced that the first release of TFS 2015 Update 2 is available. It is an RC with a go-live license, which means that Microsoft will support you if you install it in production, and it will be a direct supported upgrade to RTM once it is released. One huge thing with the release is that Update 2 includes the new Release Management vNext feature that has up until now only been available in the service (although you can use that for on premise TFS and deployments). 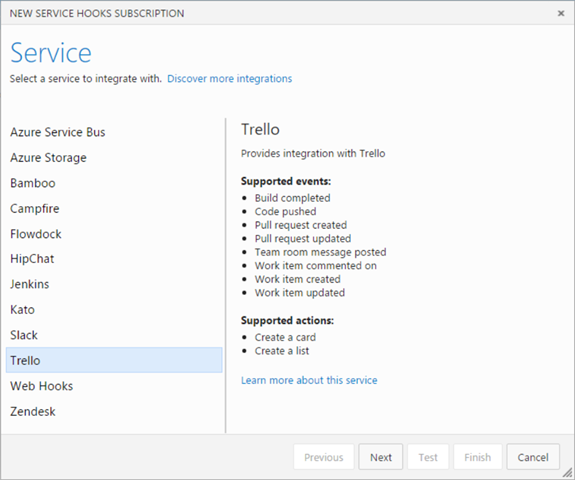 But now you don’t have to rely on VSTS for hosting the service, it is now part of TFS 2015 Update 2! Microsoft’s new version of Visual Studio Release Management is currently in public preview in VSTS. It is currently targeted for the TFS 2015 Update 2 version that should be shipped later this spring. However, even if you are not all in on Visual Studio Team Services, you can still use this service! Since the build/release agents that are used can run on premise without any necessary firewall ports being opened inbound, you have full access to any internal TFS servers and application servers that you want to deploy to. The following image illustrates the different components involved here. As you can see everything is running on premise, except Visual Studio Team Services of course. Since the release agent is also running on premise, it can connect to the on premise TFS and download the build artifacts, and it can access the on premise application servers and deploy the artifacts. 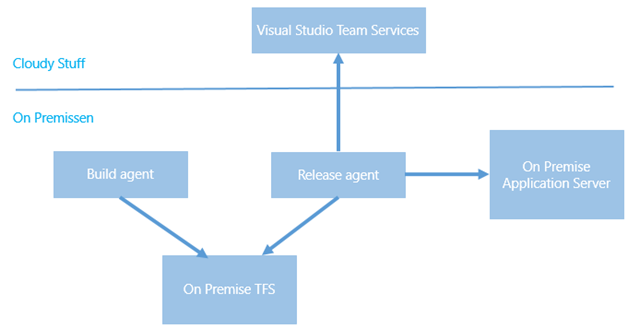 Lets’s walk through how you can use Visual Studio Release Management today to deploy builds from your on premise TFS build server to an on premise web server. Nothing special here, this is the standard output from a build that runs msdeploy to create web deploy packages. Now, to be able to consume the build artifacts from a release definition, we need to setup a service endpoint for the TFS server. 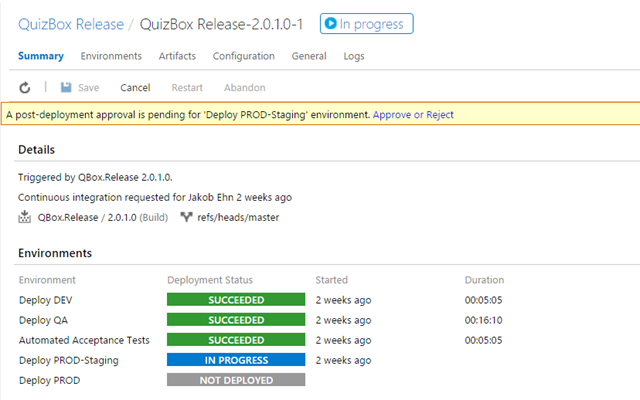 In the new build and release management system, service endpoints are a fundamental concept. They encapsulate the information, including credentials, that is needed to integrate with an external system. Example of service endpoints include Azure subscriptions, Jenkins build servers and Chef servers. In addition we can create Generic service endpoints, which contains a server URL and a user name and a password. This is what we will use here. With the service endpoint done, we can move on to create a release definition. In this example, I will define two environments, Dev and Prod that will just point to two different web sites on the same server. As you can see, I only have two tasks in each environment. The first task is a custom task that replaces any tokens found in the files that matches the supplied pattern.. This lets me apply environment specific values during the build. In this case, I will update the *.SetParameter.xml file that is used together with web deploy. Also, I use the configuration functionality to supply the machine name of the web server and the name of the web site that I will deploy this to. As you can see below, I will deploy both dev and production to the same server, but to different web sites. Not entirely realistic, but you should get the idea here. You can see that I use the variable $(webSite) in the task above, where I run the generated web deploy command file. Now, the part that is different here compared to a standard release definition is the linking of artifacts. 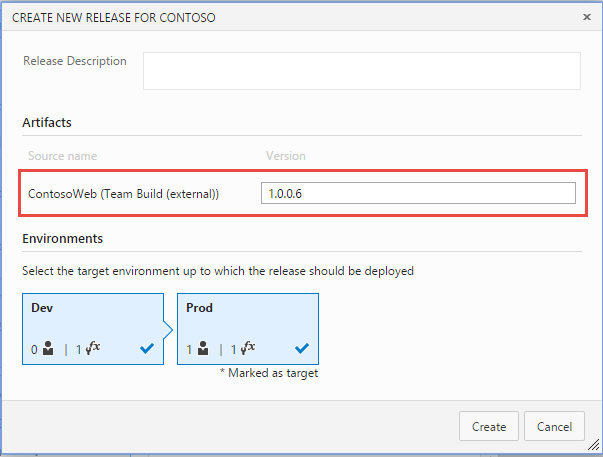 Here we will select “Team Build (external)”, which in this context mean any TFS server that is defined as a service endpoint. In the Service dropdown we select the service endpoint that we created earlier (TFS).We also need to supply the name of the team project and the name of the build definition, as shown below. NOTE: When linking to an external build like this, we do it by name. 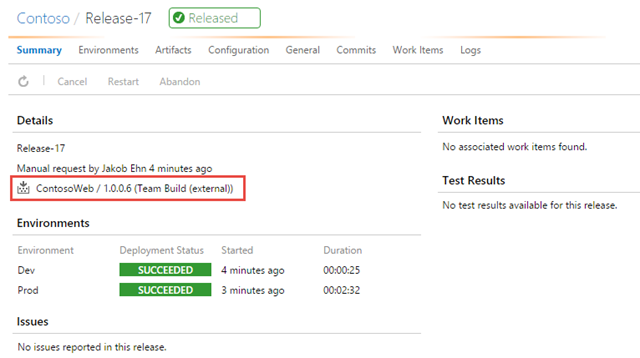 This means that if you change the name of the build definition or the team project, you will have to change this artifact definition. Now we can save the release definition and start a release. A big difference compared to when you have linked to a VSTS build is that RM won’t locate the existing builds for you, so you have to supply the build number yourself of the build that you want to release. As you can see, there is nothing that stops you from start using the new version of Visual Studio Release Management, even if you have everything else on premise. 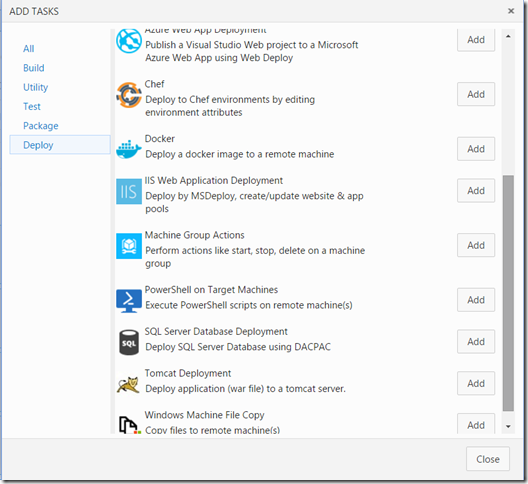 I have blogged before about how to deploy an Azure Web App using the new build system in TFS 2015/Visual Studio Team Services. In addition to configure an Azure service endpoint, it is really only a matter of using the built-in Azure Web App Deployment task. However, in many cases I have decided not to use this task myself since it has been lacking a key feature: Applying deployment parameters using the SetParameter.xml file. As I have mentioned a gazillion times, building your binaries once and only once is a key principle when implementing continuous delivery. 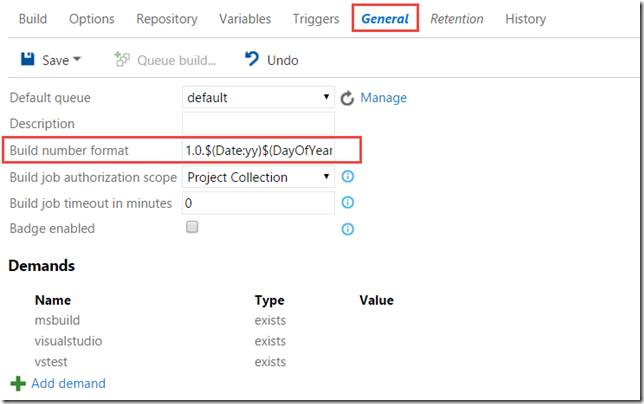 If you are using web deploy for deploying web applications (and you should), you must then use Web Deploy parameters to apply the correct configuration values at deployment time. 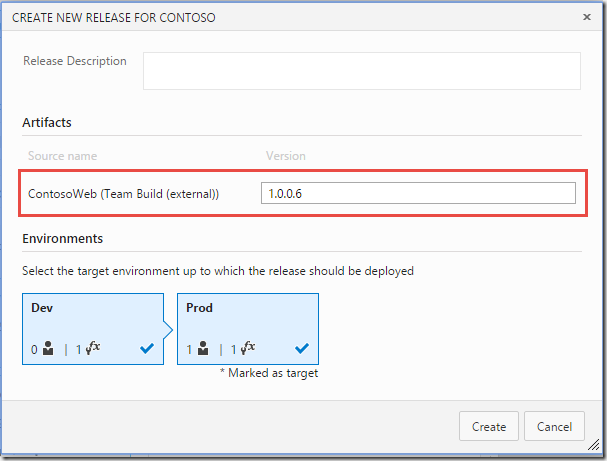 Note: In this case, I am using the Azure Web App Deployment task as part of a release definition in Visual Studio Release Management, but you can also use it in a regular build definition. This will apply the parameter values defined in the QBox.Web.SetParameters.xml file when deploying the package to the Azure Web App. Since a couple of months back, Microsoft new Release Management service is available in public preview in Visual Studio Team Services. According to the current time plan, it will be released for on-premise TFS in the next update (Update 2). Using a tool like release management allows you to implement a deployment pipeline by grabbing the binaries and any other artifacts from your release build, and then deploy them across different environments with the proper configuration and approval workflow. Building your binaries once and only once is a fundamental principal of implementing continuous delivery, too much can go wrong if you build your application every time you deploy it into a new environment. 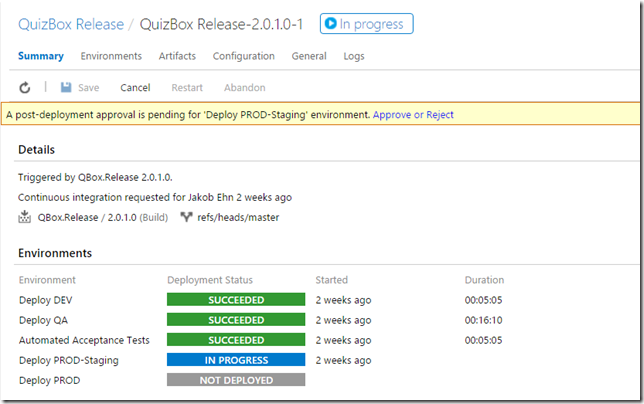 However, sometimes you might not have the opportunity to setup a release management tool like VSTS or Octopus Deploy, but you still want to be able to build your binaries once and deploy them. Well, you can still implement your deployment using TFS Build, but instead of building your source code during every build we download the artifacts from another build that already has completed. Let’s look at how we can implement this using PowerShell and the REST API in TFS/VSTS.In this sample we will execute this script as part of a TFS build, in order to create a “poor mans” deployment pipeline. If you want to use the script outside of TFS Build, you need to replace some environment variables that are used in the script below. 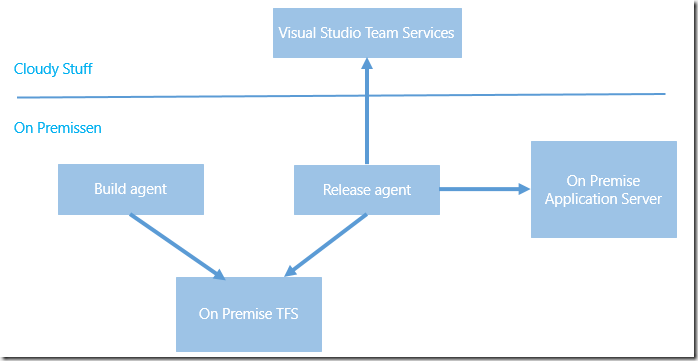 First of all, to learn about the REST API and other ways to integrate and extend Visual Studio, TFS and Visual Studio Team Services, take a look at https://www.visualstudio.com/integrate. This is a great landing page that aggregate a lot of information about extensibility. Here is a PowerShell script that implements this functionality, as well as a few other things that is handy if you implement a deployment pipeline from a build definition. Write-Error "Could not find version number data in $buildNumber." Write-Warning "Found more than instance of version data in buildNumber." Write-Warning "Will assume first instance is version." $dropArchiveDestination = Join-path $artifactDestinationFolder "drop.zip"
This is a mandatory parameter where you can specify the name of the build definition from which you want to download the artifacts from. This script assumes that the build definition is located in the same team project as the build definition in which this script is running. If this is not the case, you need to add a parameter for the team project. A switch that indicates if you want to append the version number of the linked build to the build number of the running build. Since you are actually releasing the build version that you are downloading artifacts from, it often makes sense to use this version number for the deployment build. The script will extract a 4 digit version (x.x.x.x) from the build number and then append it to the build number of the running build. As an example, if the latest release build has the build number MyApplication-1.2.3.4, the build will extract 1.2.3.4 and append this to the end of the build number of the running build. Running a PowerShell script in TFS Build is really easy, but I’ll include it here anyway. Typically you will run this script in the beginning of a build in order to get the build artifacts, and then add the tasks related to deploying the artifacts in whatever way that fits. Where MyApplication.Release is the name of the build definition that have produced the build artifacts that we want to release. 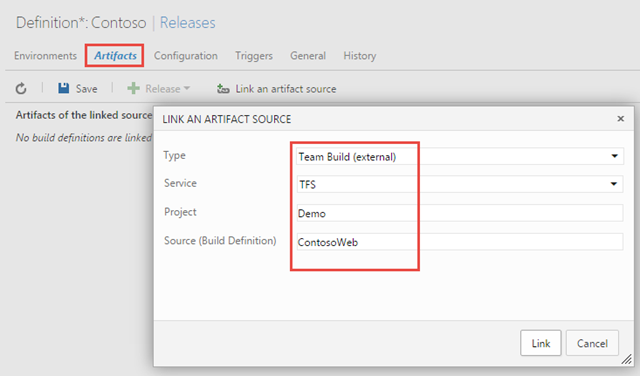 Running this script as part of the build will not download the artifacts from the latest successful build of the linked build definition and place them in the staging directory. In addition it will append the version number of the linked build (x.x.x.x) to the end of the running build. NB: You need to consider where to place this script. Often you’ll want to put this script together with the application that you are deploying, so that they can change and version together. Hope you will find this script useful, le me know if you have any issues with it! This is a unique opportunity for devlopers, startups and students that want to learn more about what Microsoft Azure has to offer and how you can implement IoT solutions together with Azure. From Active Solution, myself and Robert Folkesson will host the second part of the day, where we will guide you through the hands-on labs. With today’s announcement at Microsoft Connect() about the public preview of the next generation of Visual Studio Release Management, it is also time to announce the (imminent) release of a new book that covers among other things this new version of RM. 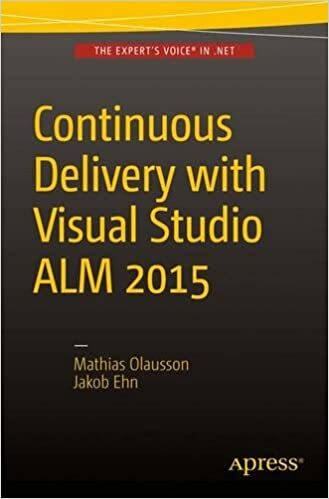 Me and my fellow ALM MVP Mathias Olausson have been working hard during the last 6 months on this book, using early alpha and beta versions of this brand new version of Visual Studio Release Management. Writing about a changing platform can be rather challenging, and our publisher (Apress) have been very patient with us regarding delays and late changes! 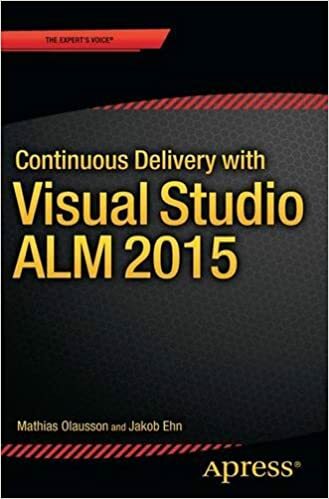 The book is titled Continuous Delivery with Visual Studio ALM 2015 and is aiming to be a more practical complement to Jez Humble’s seminal Continous Delivery book with a heavy focus of course on how to implement these processes using the Visual Studio ALM platform. The book discusses the principles and practices around continuous delivery and continuous deployment, including release planning, source control management, build and test automation and deployment pipelines. The book uses a fictive sample application that we use throughout the book as a concrete example on how to go about to implement a continuous delivery workflow on a real application. We hope that you will find this book useful and valuable! Anyone that has been involved with setting up the infrastructure that is needed to perform on premise load testing of a realistic number of users knows how much work that is to both setup and to maintain. With Visual Studio Ultimate/Enterprise you needed to create a test rig by creating multiple machines and then installing a test controller and test agents on all the machines and configure them to talk to each other. Another aspect of if is that the typical team don’t run load tests of their applications on a regular basis, instead it is done during certain periods or sprints during the lifecycle of the project. So the rest of time those machines aren’t used for anything, so basically they are just using up your resources. 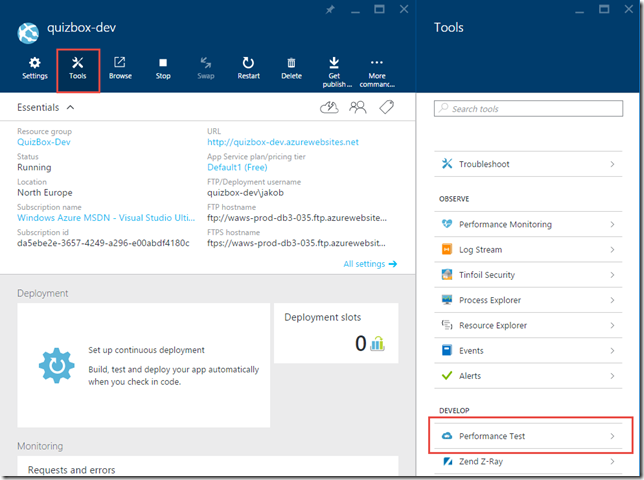 With the introduction of Cloud Load Testing, that is part of Visual Studio Online, Microsoft added the possibility to use Azure for generating the load for your tests. This means that you no longer have to setup or configure any agents at all, you only need to specify the type of load that you want, such as the number of users and for how long the test should run. This makes it incredibly easy to run load tests, and you only pay for the resources that you use. You can even use it to test internal application running behind a firewall. So, this feature has been around for a couple of years, but there has always been a problem with discoverability due to it being available only from inside the Visual Studio Online portal. So for teams that uses Azure for running web apps but are not using Visual Studio Online for their development, they would most likely never see or use this feature. 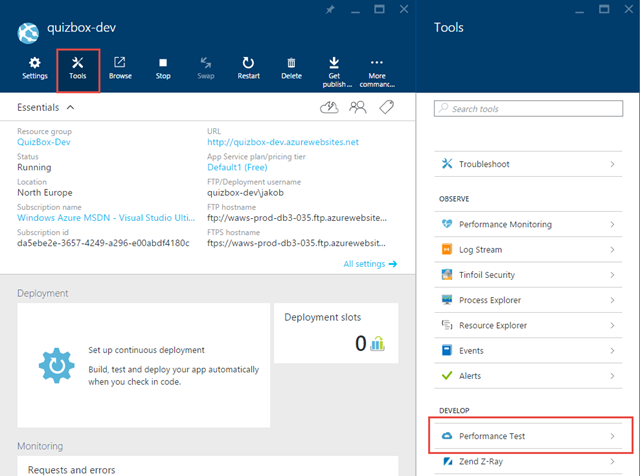 But back in September Microsoft announced the public preview of perfomance testing Azure Web Apps, fully integrated in the Azure Portal. 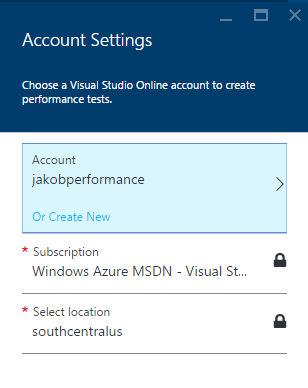 It still needs a connection to a Visual Studio Online account, but as you will see this can easily be done as part of setting up the first performance test. Let’s take a quick look at how to create and run a performance test for an Azure Web App. The new Performance Test functionality is available in the Tools blade for your web app, so go ahead and click that. The first time you do this, you will be informed that you need to either create a Visual Studio Account or link to an existing one. Here I will create a new one called jakobperformance. It does not mean that you have to use this account (or any other VSO account for that matter) for your development. Currently the location must be set to South Central US, this is most likely only the case during the public preview. about how to get started with cloud load testing. A simple thing really, but things like this can really make a difference when you are trying a new technology for the first time. The public URL that the performance test should hit. 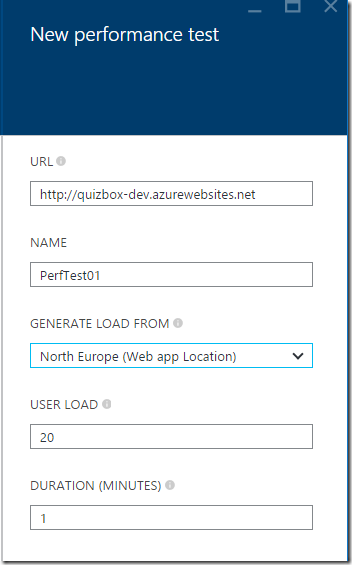 It will be default be set to the URL of the current Azure Web App, but you can change this. The name of this particular test run. 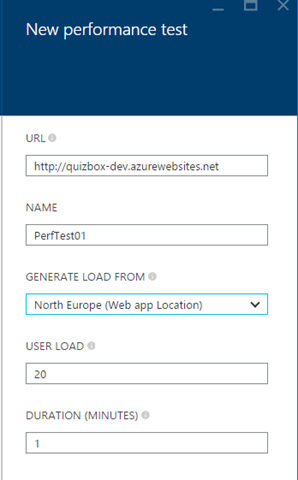 As you will see, all test runs are stored and available in the Performance Test blade of your Azure Web App, so give it a descriptive name. Here you select from which region that the load should be generated from. Select the one that most closely represent the origin of your users. The number of users that should hit your site. While this feature is in public preview you don’t have to pay for running these load tests, but there will some limits in how much load you can generate. You can contact Microsoft if you need to increase this limit during the preview period. Once this is filled out, hit Run Test to start the load test. 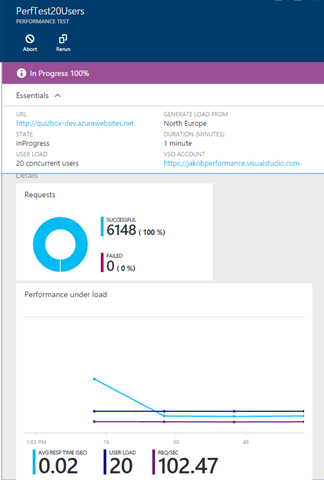 This will queue the performance test and then start spinning up the necessary resources in Azure for running the load test. Clicking on the test run, you will see information start to come in after a short period of time, showing the number of requests generated and some key performance characteristics of how your application behaves under pressure. Of course, this type of load testing doesn’t cover all you need in terms of creating realistic user load, but it is a great way to quickly hit some key pages of your site and see how it behaves. then you can move on and author more complex load tests using Visual Studio Enterprise, and run them using Azure as well. Go ahead and try it out for yourself, it couldn’t be easier and during the public preview it is free of charge! I often talk to different teams about how they work with Team Foundation Server or Visual Studio Online. I get a lot of questions about different features, and some of them tend to come up more often than other. So here is a list of 10 features in TFS that I get questions about regularly or that I have noticed a lot of teams don’t know about. It is by no means exhaustive, and it is a mixture of smaller and larger features, but hopefully you will find something here that you didn’t know about before. 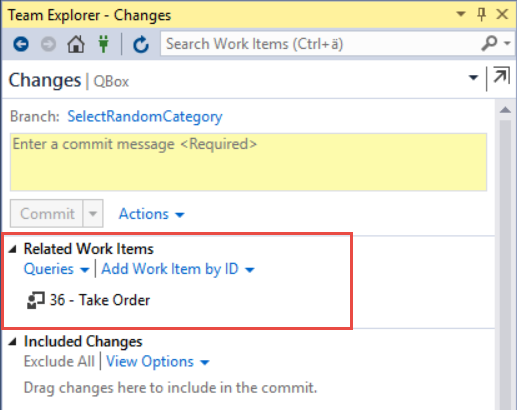 Associating work items to your changesets in TFS have always been one of the more powerful features. Not in itself, but in the traceability that this gives us. Without this, we would have to rely on check-in comments from the developers to understand the reason for a particular change, not always easy when you look at changes that were done a few years back! 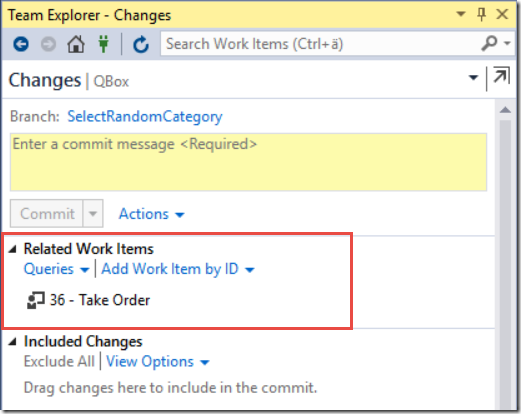 When using Git repos in TFS, and you use the Git integration in Visual Studio you have the same functionality that lets you associate a work item to a commit, either by using a work item query or by specifying a work item ID. But a lot of developers like to use other Git tooling, such as Git Extensions, SourceTree or the command line. And then we have the teams that work on other platforms, perhaps developing iOS apps but store their source code in a Git repo in TFS. They obviously can’t use Visual Studio for committing their changes to TFS. Here we associate this commit with the work item with ID 4321. Note that since Git commits are local, the association won’t actually be done until the commit has been pushed to the server. TFS processes git commits for work item association asynchronously, so it could potentially take a short moment before the association is done. Excel has always been a great tool for updating multiple work items in TFS. But over the years the web access in TFS has become so much better so that most people do all their work related to work item management there. And unfortunately, it is not possible to export work item queries to Excel as easily from the web as it is from Visual Studio. 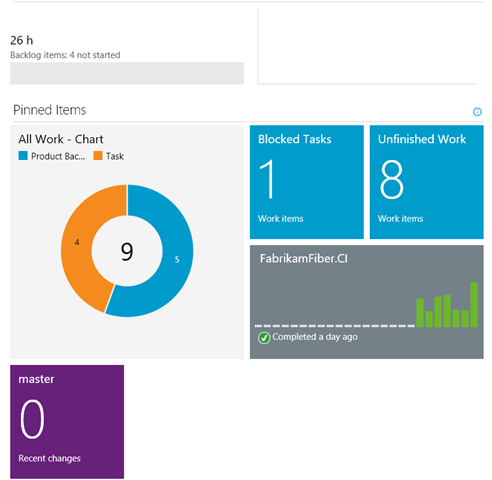 But, we can update multiple work items in TFS web access as well. 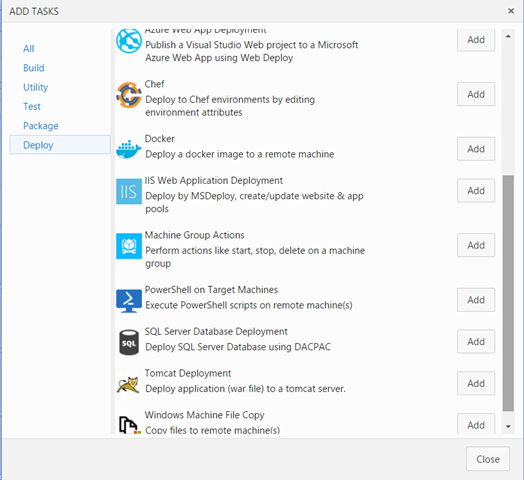 These features have gradually been added to Visual Studio Online and is now part of TFS 2015 as well. There are a few shortcut operations for very common tasks such as moving multiple backlog items to a iteration, or assigning them to a team member. 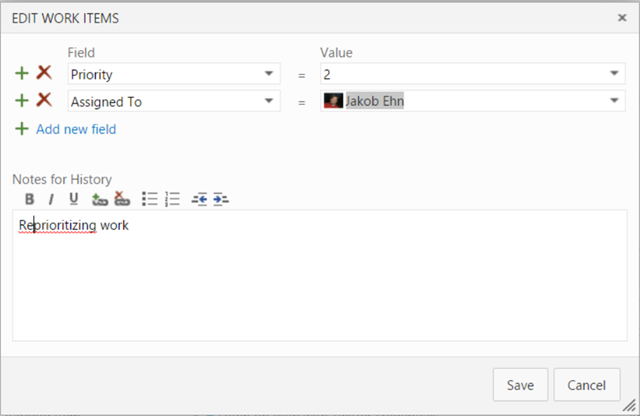 But then you have the Edit selected work item(s) that allows us to set any fields to a new value in one operation. You can also do this from the sprint backlog and from the result list of a work item query. After making the changes, you can add a meaning commit message and commit the change back to TFS. When using Git, you can even commit it to a new branch. Normally, every team member that accesses TFS and reads or writes information to it (source code, work items etc) need to have a Client Access License (CAL). For the development team this is usually not a problem, often they already have a Visual Studio with MSDN subscription in which a TFS CAL is included. What often cause some friction is when the team try to involve the stakeholders. Stakeholders often include people who just want to track progress or file a bug or a suggestion occasionally. Buying a CAl for every person in this role usually ends up being way to expensive and not really worth it. When using Team Foundation Version Control (TFVC) we have from the first version of TFS had the ability to use check-in policies for enforcing standards and policies of everything that is checked in to source control. We also have the ability to use Gated Builds, which allows us to make sure that a changeset is not checked in unless an associated build definition is executed successfully. When Git was added to TFS back in 2013, there was no corresponding functionality available. But in TFS 2015 now, the team has added branch policies as a way to protect our branches from inadvertent or low quality commits. In the version control tab of the settings administration page you can select a branch from a Git repo and then apply branch policies. The image below shows the available branch policies. I really recommend that you start using these branch policies, they are an excellent way to enforce the standard and quality of the commits being made, and can help your team improve their process and help move towards being able to deliver value to your customers more frequently. Work Item Queries are very useful for retrieving the status of your ongoing projects. The backlogs and boards are great in TFS for managing the sprints and requirements, but the ability to query on information across one ore more projects are pivotal. Work item queries are often used as reports and we can also create charts from them. The problem with this was of course that as soon as the sprint ended and the next one started, we hade to update all these queries to reference the new iteration. Some people came up with smart work arounds, but it was still cumbersome. Enter the @CurrentIteration token. This token will evaluate to the currently sprint which means we can define our queries once and they will continue to work for all upcoming sprints as well. this token is unfortunately not yet available in Excel since it is not team-aware. Since iterations are configured per team, it is necessary to evaluate this token in the context of a team. Both the web access and Visual Studio have this context, but the Excel integration does not, yet. The new homepage has been available since TFS 2012, and I still find that most teams does not use the possibility to pin important information to the homepage enough. The homepage is perfect to show on a big screen in your team room, at least if you show relevant information on it. The tile will show the number of work items returned by the query . Focus on pinning queries where the these numbers are important and can trigger some activity. E.g. not the total number of backlog items, but for example the number of active bugs. This tile shows a bar graph with the history of the last 30 builds. Gives a good visualization of how stable the builds are, if you see that builds fails every now and then you have a problem that needs to be investigated. Support for tagging was first implemented back in TFS 2012 Update 2. This allowed us to add multiple tags to work items and then filter backlogs and query results on these tags. There was however a big thing missing and that was the ability to search for work items using tags. This has been fixed since TFS 2013 Update 2, which means we can now create queries like this. It is also possible to work with tags using Excel, this was another big thing missing from the start. One of the most common questions I get when talking to teams that use TFS is how they should handle bugs. 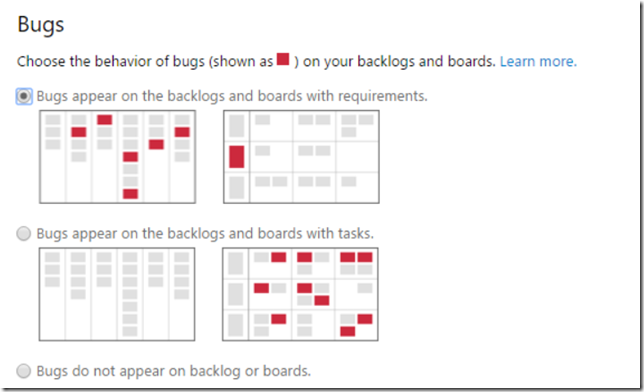 Some teams want to have the bugs on the backlog and treat them like requirements. 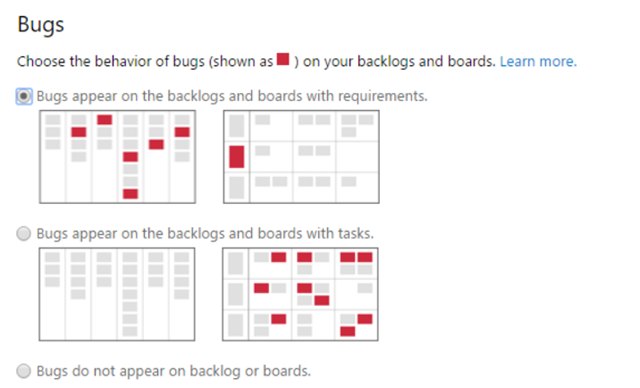 Other teams want to treat them more like tasks, that is adding them to the corresponding user story or backlog item and use the task board to keep track of the bug. The good think is that you can configure this per team now. On the team settings page, there is a section that lets you configure the behavior of bugs. Extensibility and integration are very important to Microsoft these days, and this is very clear when looking at the investments for TFS 2015 that included a bunch of work in this area. 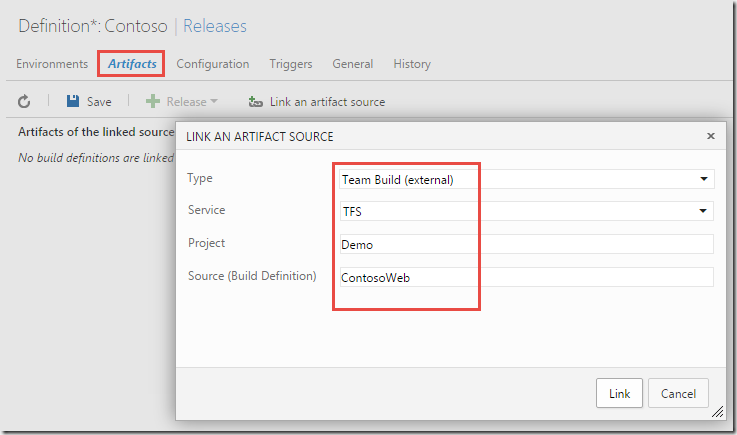 First of all Microsoft has added a proper REST API for accessing and updating most of the available artifacts in TFS, such as work items and builds. It uses OAuth 2.0 for authentication, which means it is based on open modern web standards and can be used from any client on any platform. 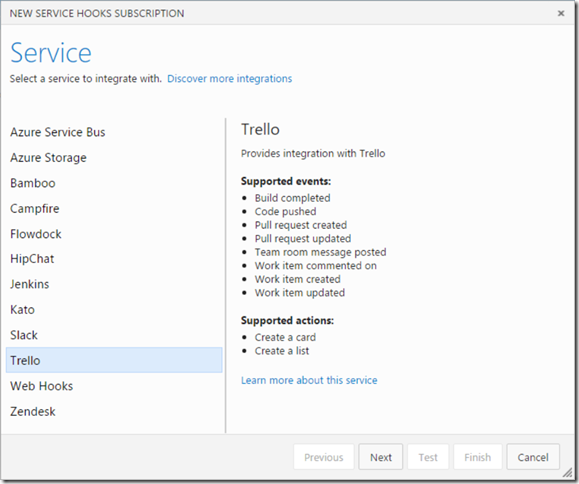 In addition to this, TFS 2015 also support Service Hooks. A service hook is basically a web endpoint that can be called when something happens, in this case in TFS. So for example, when a backlog item is created in TFS we might want to also create a card in Trello. Or when a new change is committed into source control, we might want to kick off a Jenkins build. And the list keeps growing, in Visual Studio Online there are already 7 more services offered, including AppVeyor, Bamboo and MyGet. Note that the list contains one entry called Web Hooks. This is a general service configuration in which you can configure a HTTP POST endpoint that will receive messages for the events that you configure. The messages can be sent using JSON, MarkDown, HTML or text. This mean that you can also integrate with internal services, if they expose HTTP REST endpoints. By now, many of you should have had the chance to at least play with the new build system that was released in TFS 2015 and Visual Studio Online. Here is an introductory post I wrote about it when it entered public preview back in January. Doing the basic stuff is very easy using the new build system, especially if you compare it with the old one, which is now referred to as XAML builds. Creating and customizing build definitions is just a matter of adding the tasks that you want to use and configure them properly, everything is done using the web interface that is part of the TFS Web Access. There are (of course) still some things that are not completely obvious how to do. One of these things is how to generate a custom build number for a build. Every build definition has a build number format field where you can use some macros to dictate what the resulting build number should look like. The build number format can contain a mix of text and macros, in the above example I have used some of the date macros to generate a build number that uses todays date plus an increment at the end. Sometimes though you will have the requirement to generate a completely custom build number, based on some external criteria that is not available using these macros. As you can see, there is a special format that is used for these commands: ##vso[command parameters]text. This format allows the build agent to pick up this command and process it. This will change the build number of the current build to 1.2.3.4. Of course, you would typically generate this value from some other source combined with some logic to end up with a unique build number.